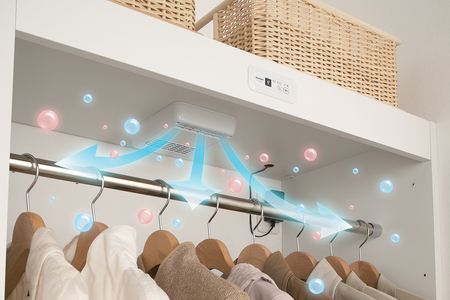 Your Closet Can Get Rid Of Odours By Releasing Ions | OhGizmo! By David Ponce on 03/27/12 • Leave a comment! When airborne, these positive and negative ions, fasten to the surfaces of suspended microbes, forming highly oxidising hydroxide (OH) radicals and instantly removing the hydrogen (H) from the surface proteins. This results in the physical breakdown of the surface membrane of the microbe, rendering it inactive. As we know, it’s the microbes that stink the most, although the company claims you can get rid of other smells, like tobacco. It’s not cheap though, as the system will set you back $480. Fortunately it doesn’t rack up your energy bill much, since it consumes just 3.8W of power.